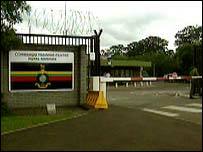 An 18-year-old Royal Marine has died after falling ill at an east Devon training base. Richard Campbell-Smith fell ill at the Commando Training Centre at Lympstone, near Exmouth, before being taken to the Royal Devon and Exeter Hospital. The teenager was then believed to have suffered a cardiac arrest on Tuesday morning. A post-mortem examination is under way. About 40 of his fellow trainees have been recalled from a training exercise. A spokesman for the Minitry of Defence said: "We're extremely sorry at the death of a promising young recruit who seemed to have a bright future in the Royal Marines. Our thoughts are with his family." The base, which is set on a 95-acre site, oversees the training of about 1,200 military recruits a year.